Helen Garner’s Everywhere I Look, a collection of personal essays and diary notes, delighted readers and it went on to become one of our bestsellers. 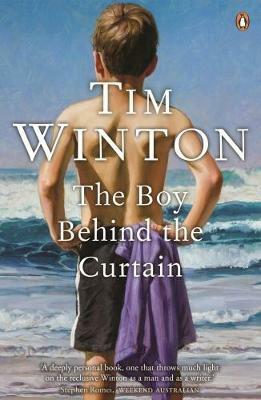 I’ve got a feeling that Tim Winton’s collection, The Boy Behind the Curtain, will hit the same mark. Like Garner’s, this book is a collection of pieces, some previously published and others appearing for the first time. Last year Hamish Hamilton published another Winton collection, Island Home, featuring work on the landscape and environment. The Boy Behind the Curtain is much more personal and much more revealing and has, I believe, a much stronger appeal. Winton is arguably one of our most loved and respected writers; he writes in a vernacular that is distinctly his but one which resonates strongly with readers. He is also an intensely private person who rarely appears comfortably in public, so that makes this book even more special. It’s probably the closest we’ll get to seeing the interior Winton. The pieces range across a number of topics, but the ones about his family resonated most strongly with me. His father, a country copper, was an important influence on his life, giving him a strong moral compass which was later reinforced by the family’s conversion to the Church of Christ and a literalist interpretation of the scripture. Some of the pieces where he deals with this certainly made Winton the writer and the person click with me. There’s a lovely piece where he pays homage to Elizabeth Jolley who taught him writing at the West Australian Institute of Technology, although, according to Winton, it was more as though: ‘We learnt to write alongside her, or perhaps it’s more accurate to say in her wake.’ This is a brilliant collection of insights. You’ll come away intrigued, delighted and perhaps a little bit wiser.